In a world-leading study, New Zealand researchers are working with the US Department of Agriculture (USDA) to piece together a 15-million-piece genetic jigsaw. Improvement Corporation in collaboration with the USDA, are using LIC Jersey and Holstein-Friesian bulls to build a genetic map of New Zealand dairy cattle. Improving the genetic reference sequence is expected to have multiple flow-on effects, from the ability to identify disease genes, to increasing the speed of delivery for breeding worth traits. This will lead to more efficient cows and thus environmental benefits, and alleviate animal welfare concerns attributable to diseases that may be able to be bred out of the population. Improvements in genetic gain have substantial financial impacts for farmers and the New Zealand economy. Back in 2009 after a six-year effort, the US Department of Agriculture (USDA) and a consortium of 300 scientists from 25 countries published the first cattle genome sequence of a female Hereford cow called Dominette. Dominette has since gone to the great pasture in the sky, but has lived on in research laboratories around the world where researchers have used her DNA sequence to make an array of genetic discoveries. With improvements in technologies for genome sequencing, Dominette’s sequence is getting an overhaul to improve accuracy. The ongoing work LIC is doing to chart the DNA differences between beef and dairy cattle will help scientists understand what role different genes play in traits like milk production, fertility, and body condition, and the potential these genetic markers might have for the country’s dairy herd. Each DNA sequence makes up a piece of this complicated jigsaw puzzle. This research was funded by the Transforming the Dairy Chain (TDVC) Primary Growth Partnership programme, a seven-year, $170 million innovation programme led by commercial partners including LIC, DairyNZ and Fonterra, and partnered by MPI. LIC’s acting chief scientist, Dr Bevin Harris, says that the collaboration with the USDA will bring benefits for the New Zealand dairy herd. The bovine genome has three billion base pairs (the building blocks of the DNA double helix) containing 22,000 genes, 80 percent of which are shared with humans. Within these 22,000 genes there are genetic variants. To use a book analogy, each cow has the same number of chapters, i.e. 22,000. But there are a number of word and spelling changes (variants) in each chapter of each book. You could read any book and be able to broadly describe what they are about, but there would be slightly different contextual differences with different interpretations. This is what leads to diversity within a species. Put crudely, everybody looks the same (the same book of 22,000 genes), but there are slight differences in most traits or characteristics. 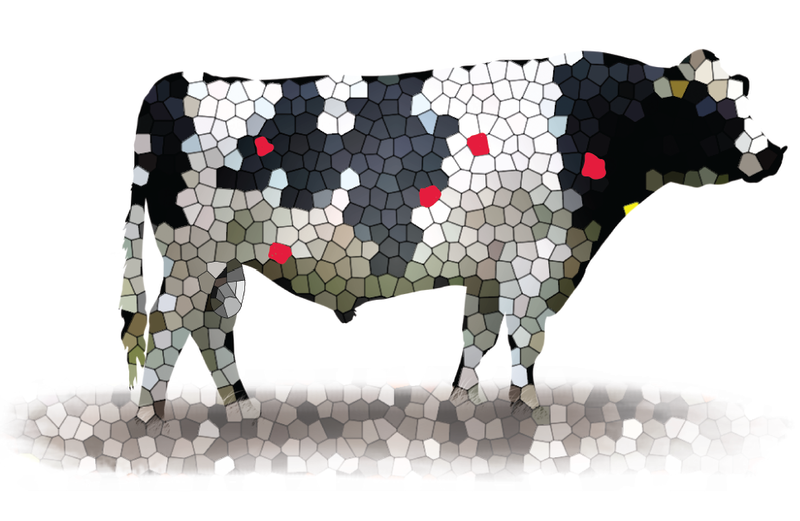 By the end of this year, genomes from 1000 dairy cattle will have been sequenced. Through this sequencing, LIC has identified about 19 million variations that exist within the New Zealand dairy cattle population. These will be compared to both Dominette’s and the new dairy cattle reference genomes, and the next job will be to identify which of these genes affect the traits that dairy farmers are interested in. This information can then be used to improve the ability to predict how well animals will perform at birth based on their genome sequence. In the last three years, improvements in DNA sequencing technology have meant that the cost of sequencing a new genome has fallen dramatically and newer technology also means that genomes can be sequenced more quickly at the touch of a button. What was once a massively costly exercise (US$50 million when Dominette’s genome was sequenced in 2006), now costs NZ$1000 per genome. To give an idea of the complexity of genome sequencing, and how far the technology has come, Dr Harris says if it had to be done manually, it would take someone typing 60 words per minute eight hours a day for 50 years to type the bovine genome. “The knowledge gained from this sequencing project will enable us to identify the potential benefits of genetic gains for the New Zealand’s dairy herd, and this will deliver more accuracy around bull selection which will increase the national rate of genetic gain,” says Dr Harris. New Zealand Animal Evaluation (NZAEL), a wholly-owned subsidiary of DairyNZ, estimates that currently, improvements in genetic merit are worth $300 million profit a year to the dairy sector. This figure is likely to increase with improvements in genetic gain. Genetic scientists at herd improvement and agri-technology cooperative LIC are using jersey and Hostein-Friesian bulls to build a genetic map of New Zealand dairy cattle.